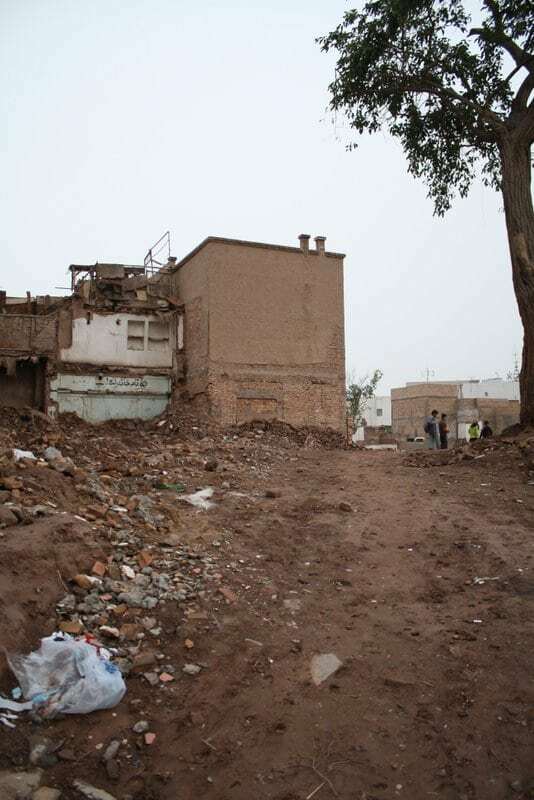 Kashgar’s Old Town Bulldozed; Is Uyghur Culture in Danger? Within the narrow alleyways of this Old Town lie thousands of years of Kashgar’s history. Aged wooden doors and cobblestone paths have witnessed the passage of innumerable donkey carts, small Uyghur children and, in recent times, many foreign tourists. On the outside, these mud-brick walls seem at peace with their place in history but just beyond the padlocked door a crippling truth emerges. Squinting through the cracks in the doorway it is possible to see that these walls no longer house Uyghur inhabitants. 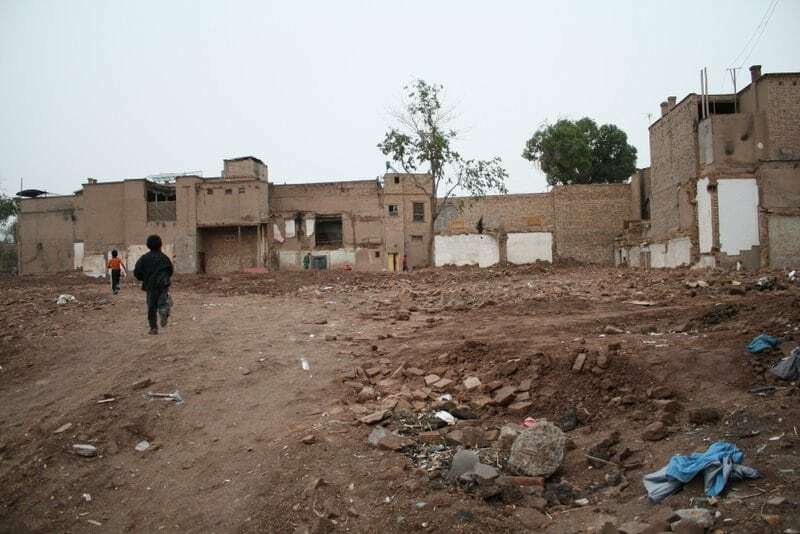 Instead, they hide the heartbreaking destruction of Kashgar’s Old City. Over two-thirds of the city has already been leveled. History has been replaced by rubble; donkey carts by bulldozers. Like a prisoner waiting for its execution, many walls still stand with the simple Chinese character 拆 (“chai”) meaning “destruction”. Some of these condemned city blocks will reportedly be turned into a tourist center to keep the cultural heritage alive, but nothing will be able to replace what has been lost this month. It is very easy to let emotions to control the debate about China’s decision to demolish the Old Town of Kashgar. The Chinese have an uncanny way of making a mess of their minorities. In order to fully understand what has happened here, however, both sides of the story must be presented. 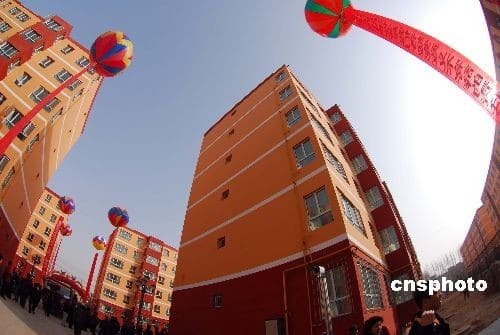 China has spent a total of $448 million dollars as part of its plan to relocate over 220,000 Uyghur residents from the unsafe homes in the Old Town community to a newly built apartment complex. According to city planners, the area has suffered from overcrowding, poor drainage, dangerous fire hazards, and susceptibility to earthquakes. There is no doubt that these homes would break every fire, safety, and building code in any western country and it is in the best interest of city officials to protect its citizens. Compensation has been offered for those whose homes have been destroyed and the new apartments, besides meeting city standards, are a drastic improvement over the shoddy Old Town homes. The average Han Chinese citizen doesn’t understand the international ruckus that this government investment in Kashgar has caused. Not only is the government providing new housing for the Uyghur but they are protecting them from potential problems which they cannot afford to fix themselves. Part of the Old City will still be preserved and a tourist center has been planned for the area. The world seems to be heaping criticism on a project that they believe might, in the case of a future earthquake near Kashgar, save many lives. 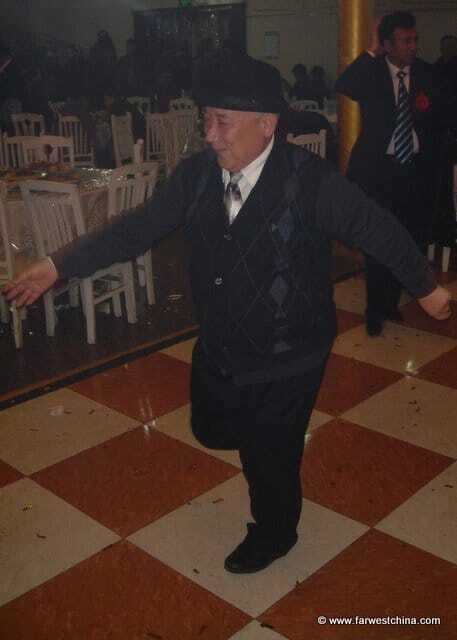 The Uyghur have long felt that the Chinese government is slowly destroying their heritage and culture. Signs of this destruction are evident in the trend of Xinjiang’s ethnic demographics over the past three decades and continue to be felt in major city projects like this one. Kashgar, historically the heart of Uyghur culture, tends to suffer the tightest control from Beijing (exemplified by the oversized Mao Statue). Sure, the government is providing housing and compensation for those who have been displaced, but at what cost? These buildings have withstood thousands of years of whatever Mother Nature could send their way and yet they still stand. 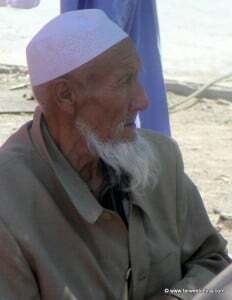 Many Uyghur argue that living in the Old Town is safer than the modern Chinese concrete high rises they are being moved to. Another concern is the lack of employment. A roof over the head is great, but without a steady income it will be difficult to put food on the table. Most of the previous employment was interconnected with the Old Town itself, so when it was destroyed so was their livelihood. While the Washington Post made waves by breaking this story, I think an article by The National did a better job of dissecting the situation. The circumstances are not a simple black and white, so I believe it is wrong when the Chinese paint this as an act of selfless giving to their minority neighbors. At the same time, I also believe it would be wrong for the international media to turn this into a conspiracy to completely destroy Uyghur culture. Saying that the Uyghur culture is built entirely on wood, hay and stubble (or in this case mud) is in itself a mockery of this very beautiful people. That’s not to imply that the Uyghur don’t have a right to feel threatened. It is obvious that they will not be getting much (if any) help in preserving their identity, so it is entirely up to them. 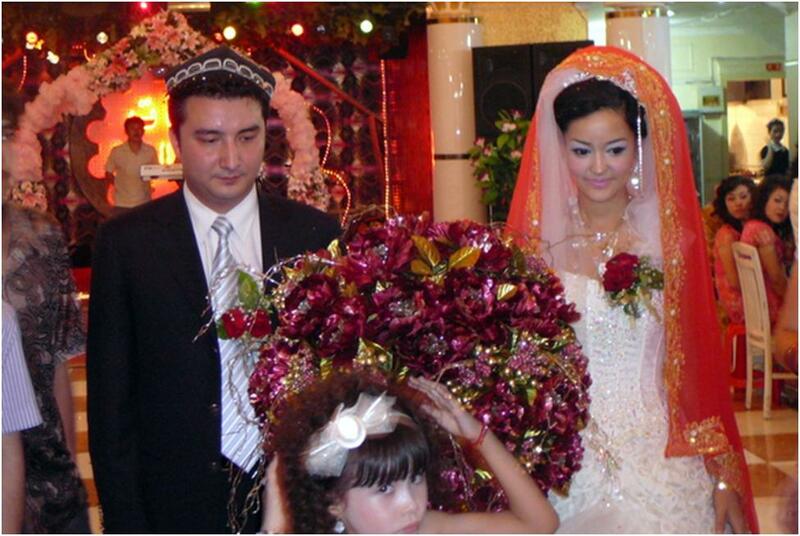 When events like these strip Uyghur of their power to protect their identity, there is plenty of room for concern. I am not naïve enough to believe that the motives of certain powers-that-be in China are entirely pure, especially considering its history dealing with minorities, but I do agree with the article by The National that this clash has “more to do with cultural sensitivities than politics”. China is on a mission to secure this province and all of its oil resources and its most successful method of doing so has been rapid development with large investments. It’s the same mentality they use with their national monuments. Think about the Great Wall. What was it once made of? Wood, mud, and stones. Now it has been rebuilt with concrete steps, metal railings, and gondolas. I still find the crumbling parts of the wall the most beautiful. The same goes for Kashgar’s Old City. No matter what renovations and Silk Road museums take the place of of the mud brick walls, I will always remember the beauty of the ragged and dirty alleyways of old. I would like to extend a special “thanks” to Lauren from the Abandon the Cube blog for her stories and use of a few of the pictures you see above. 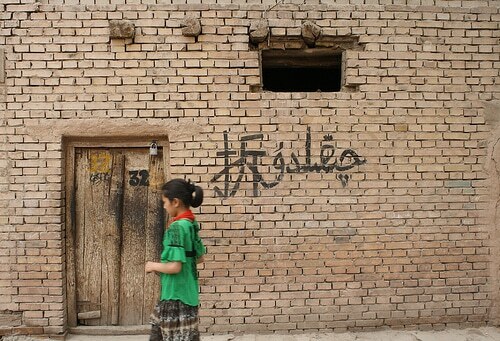 Please read about her trip to Kashgar or check out more of her pictures on Flickr. Thanks Lauren! And thanks for sharing your photos! “these buildings stood thousands of years”? Are you sure these mud houses being there for thousands of years? A little more research please! I am planning to go to XinJiang during the October holiday. I was looking forward to seeing the Old City but am wondering what is left of it – do you have any recent updates? If the Old City is basically destroyed, is Kashgar still a good choice for a first trip to XinJiang? 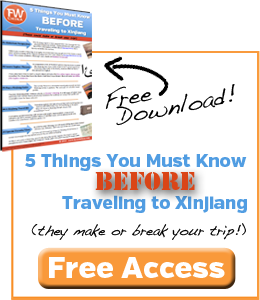 I will be traveling with a Han Chinese (I am American and have lived in China for more than 9 years). I am assuming there is relatively little personal safety risk for both of us – is that an accurate assessment? Hey Brad. There’s still plenty of the Old City to see and I think it’s interesting to view the destruction in contrast to the new construction. Don’t cancel your trip. As for safety, I think you’re fine as long as you have common sense. No big deal. If you have specific questions, email me at josh [at] farwestchina.com. I can also point you to some recent pictures so you can get an idea of what the Old City looks like right now. Enjoy your trip! About earthquake-proof buildings, Chinese ones are surely much better than Uyghur adobe houses : the building does not fall down into rumbles, it just tip over! There are some pictures on my blog of Kashgar’s old lanes which have not been demolished yet. And I will post some more that I took myself during my vacation recently. Those who are interested can subscribe to the blog. All the best.